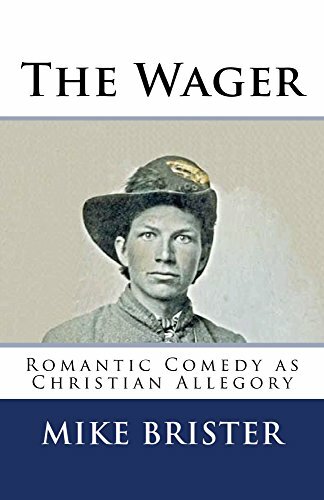 The Wager is written as a cross between a romance novel and a play. We meet two very distinct characters and we quickly fall in love with them. Sarah Dumont is a famous actress, rich, grew up in a prominent family as the oldest child. Because of her status, she is driven, focused, and pretty much snotty. Matt Shepard is not rich, who was the youngest child growing up on a farm. Matt is working hard at putting pieces of his life back together, friendly and sly. The two meet based on a wager: Sarah is challenged that she wouldn’t be able to earn Matt’s attention. Sarah’s first intention was to have him make furniture for her in LA. Then when the wager is made, I felt like something was missing within the story line. Sarah wants furniture, then the woman tells her Matt wouldn’t meet with her no matter. From there, it seems Sarah’s immediately offended being told she wouldn’t be able to get Matt out on a date. I felt I needed something more to explain. When they finally do meet, from there on, the two personalities clash and are full of hilarious banter. You can’t help but love them. I also love the use of Doodle, Matt’s dog, in the story. It only made me love Matt all the more. I found him to be very charismatic and charming. The writing style flowed nicely. The only thing I wasn’t too fond of was that the narrative repeated pieces of the dialogue and vice versa. Having to read too much repetition made me skim more than I’d like. However, it was easy to get the feel of the southern accent. Whether you’re Midwestern, southern, northern or from Mars, readers will find themselves slipping into a southern accent. Sometimes it was difficult for me to gather the feelings of the characters but I think it’s really up to the reader. After reading parts of the scene, I would go back and reread in order for me to get the sense of how they felt during the incident. I feel this is primarily due to the fact that it’s more of a play (or movie/TV script). Regardless of the few “negatives,” I thoroughly enjoyed the read. It had humor, it had tears, it had love, and of course, a hidden moral to the story. Mike Brister was born in Jackson, Mississippi, in 1952. His father worked for the Illinois Central Railroad and in 1955 was transferred to New Orleans, Louisiana. This began a lifelong relationship with one of the most unique cities in the world. Eventually, the family would return to Jackson. Mike received degrees in mathematics and spent his working career as a consulting actuary. Now retired, he has written his first novel. He has made numerous trips to Haiti and plans more. 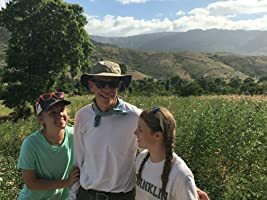 The hope is that the novel is a fun read and allows for the purchase of goats for families in Haiti. Events: Prime Ministers During the Alien Era is a mock history text during the period of Roswell crash landing until the “current” space war. The text focuses on politics and personality conflicts, both fiction and non-fiction. First, let me start off by saying, with the exception of Star Trek, I’m not big on anything alien—that’s not to say I never read or watch alien-type things because after all, I have written reviews on such topics. That said, I found this mock history text quite amusing. It held a slow but steady pace as a real textbook would go. It’s not long at all (just over a hundred pages), so I finished in less than two hours. The prose held my interest, however, it read more as a cross between a long narrative and a student history paper. As a textbook would have, it held footnotes, which made me want to go back and read what it referred to in the prose. At the end of the book, Murphy explains which parts of his prose were fiction and which were nonfiction. This was a good way for us to know how he weaved the truths and fiction into an intriguing read. There were misspells (not a lot, so I’m not dwelling on the issue. Even the greatest of authors have misprints). The quotation marks weren’t very consistent. Sometimes it had a single quotation mark (which would make sense seeing as it is a British text) and others were doubled. 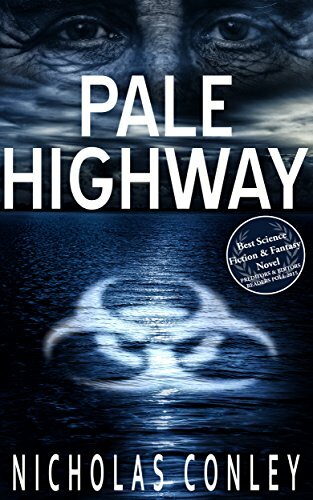 If you’re wanting to read a fast-paced story about aliens, then this won’t be for you. However, if you like aliens, science fiction, and historical texts, then I recommend this. It’s a fun, light read as to what might happen should we ever have to deal with aliens! Since Amazon and Goodreads only offer whole stars, I’m bumping this story to 4 stars, though my actual rating is 3.5. 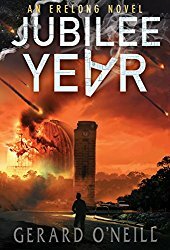 Jubilee Year-A Novel is the story of what would happen if our sun had a long-lost twin that had been traveling the universe and was now on its way back home. And governments knew it but didn’t tell the populace. Elite saw it coming and were prepared for its happening but the general population was left on its own. In Jubilee Year Gerrard O’Neill gives us a taste of what happens when a few people discover the truth and try to survive the coming catastrophe. 18 years old Storm just wants to figure out what to do with his life while dating 22 years old Penny. Penny’s father is director of one of the most famous observatories in the world and thus in a position to see what’s happening in the solar system we live in. 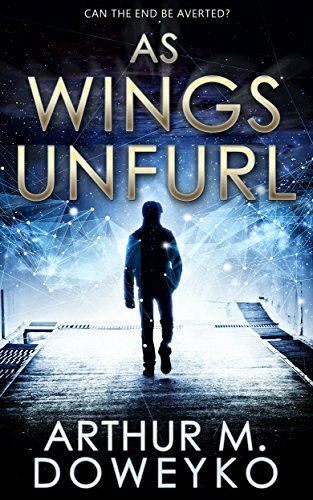 That knowledge throws Storm into an adventure he never expects as he gets caught up in protests, paramilitary groups, and a super-secret agent of the Australian government. The relationships in the book are not bad. Although the Storm and Penny dynamic leaves something to be desired at times. The other connections in the book are pretty good with the exception of how a character named Darren turns out. I was a bit surprised about him and that seemed a little forced to me. I could see sort of why it was thrown in but maybe it could have been handled better, maybe not so rushed. I don’t know science of the nature discussed in the book, but I don’t think you need to. It is all explained well and made you believe what is being stated. That’s what counts. The main issues I had with the book were the head hopping within scenes where I couldn’t tell who was talking or thinking. And there are some proofreading issues that are evident. These two factors made reading not as enjoyable as it could have been. Overall it was a good story idea, a quick read that kept you turning the pages to see what would happen next. I gave Jubilee Year-A Novel 3 out of 5 stars instead of a 4 because of the head hopping. It really took away from the flow of reading. The story itself is good and even being over 400 pages I read it in one day. So I do recommend the book for those who like the apocalyptic type of genre. 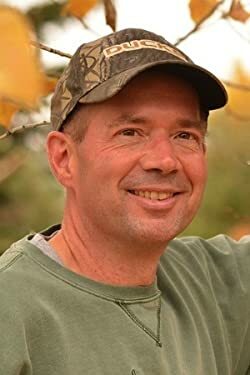 September Sky begins the American Journey series with Chuck Townsend, an unemployed San Francisco reporter, and his college-dropout son, Justin. During a cruise, they attend a lecture where Professor Geoffery Bell discusses the possibility of time travel. Soon after, he offers the Townsends the chance of a lifetime. Though skeptical, they embark on an incredible journey to 1900. 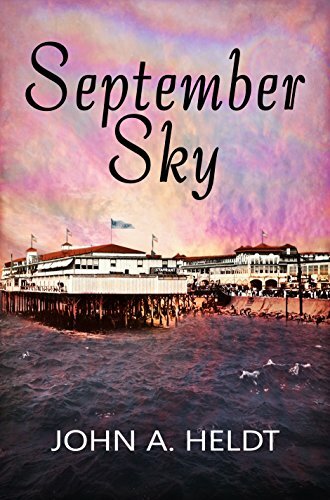 September Sky has pretty much everything you could want in a book: history, love, adventure and mystery. Although Chuck Townsend and his son were instructed to go to Chicago, they ride the train to Galveston, Texas, in hopes to right a wrong. In doing so, they each fall in love with a duo of librarians, make new friends and ultimately enemies. Character development was energetic and well-developed. My favorites were Justin and Emily. They seemed most real and I enjoyed getting to know them. Chuck and Justin, who were just beginning to find common ground for their own struggling relationship gradually grew throughout the book. The era and its customs were also well researched. I felt I was there–however, I do feel the dialogue for the 1900 characters seemed a little too modern. Of course, that wasn’t a deal breaker for me. The story itself was slow moving but steady. It was predictable from having read books three through five before picking up September Sky, although I did come across a few fun twists. While this isn’t my favorite book of this series, September Sky is well worth the time to read. I had to force myself to put it down. 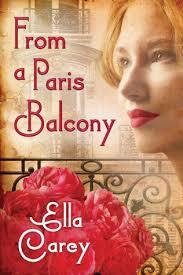 My birthday isn’t here yet, but I have just finished “From a Paris Balcony”, a gift from a dear friend. Here’s what I think of it. “From a Paris Balcony” tells the stories of two women from two different centuries, both lost. Louisa Duval (nee West) longed for freedom and independence in conservative 19th century Europe, while Sarah West longed for the husband and family she would now not have. They are bound by a devastating death, Louisa’s through suicide. To escape the pain in her life, she fled to Paris on a personal mission to discover the story of Louisa, her great great-aunt’s death after discovering a letter written to Louisa’s husband, Henry from one of Belle Epoque Paris’ notorious courtesan, Marthe de Florian. Guided by her instinct, Sarah searched for answers as her path crosses that of Laurent Chartier, an acclaimed artist who seems to be on his own private journey. Will Sarah find the answers she is searching for? Did Louisa? The women’s lives ran parallel in their attachment to their ideals and the future they wanted. Will they dare to embrace the lives they have, instead of the lives they wish? Other than the romance, “From a Paris Balcony” highlights the conflict and hypocrisy of morality, class and norms in late 19th century Europe, particularly Paris and London. It also brings the issue of gender inequality to the fore. Yes, and enjoy it. There are whimsical and reflective elements to this book, and few could escape the romanticism of the City of Light. Now I wish I was back there 😉 !